Water plants that are suitable for the middle ground are the most varied group for aquascapes or planted tanks in general. Many plants that grow to a larger height are also suitable for the middle ground if they are trimmed back on a regular basis. With narrow-leaved aquatic plants like Ludwigia arcuata, Pogostemon erectus or Rotala sp. ?Green? you can build attractive groups in your aquascape. A great number of Cryptocoryne species is also suitable for the middle ground, and their leaf forms and colours contrast beautifully against stem plants. Medium-sized ferns or Anubias variants are also suitable middle ground plants. In aquascaping, the middle ground is where you place your hardscape (driftwood and rocks), which in turn can be planted with mosses or epiphytic plants. The middle ground is the most important area in an aquarium or aquascape, because from a design point of view, it is naturally the most eye-catching. Here the design possibilities are particularly varied. Lots of various aquarium plants are suitable for middle ground planting. 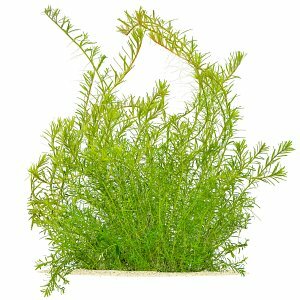 In our online shop we offer a rich selection of such plants; Aquascaping enthusiasts and plant aquarists as well as "normal" aquarium owners get their money's worth with us. Fast shipping contributes to the high quality of our aquarium plants. You can also buy rare plant species for the middle ground from us online - some of which we cultivate ourselves. The growth height, but of course also the height of the aquarium tank and the desired design style play a role in determining which aquarium plants are suitable for the foreground, middle or background; of course, no sharp boundaries can be drawn here. The selection of stem plants is particularly varied, as the growth height of these can largely be regulated by pruning and replanting shoot tips. For example, with different Rotala-, Ludwigia- and Alternanthera-forms, multicoloured or fresh green bushes can be created, which also transition between the back and foreground of the aquarium with their stepped growth height. Skilful selection of different textures and leaf sizes is one of the means of increasing the depth effect in aquascaping. Exotic plant forms such as Tonina fluviatilis and Syngonanthus macrocaulon come from the Eriocaulon-relationship; they are a special attraction as a group in the middle ground of the aquarium. Some strictly upright, slow-growing stem plant species such as Lindernia sp. "India" and Rotala indica look best if they are not allowed to grow taller than 10 to 20 cm. 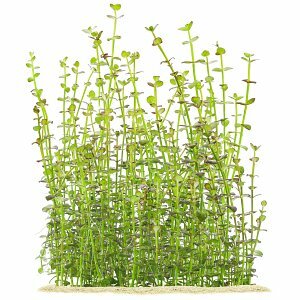 Even low, bushy, spreading aquarium plants like Staurogyne repens and Limnophila sp. "Vietnam" have their right place here and are suitable for harmoniously connecting the fore- and middle ground areas of the aquarium. 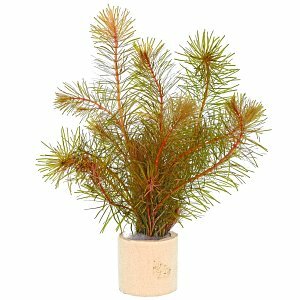 We provide help with the handling of stem plants in this Wiki article. For rosette plants such as Echinodorus, Cryptocoryne, Lagenandra and Eriocaulon, on the other hand, the maximum height that a plant species or variety can reach must be taken into account. 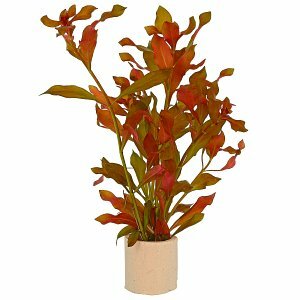 Especially water trumpets (Cryptocorynes) often reach their maximum height only after a period of long, undisturbed growth, for example Cryptocoryne cordata var. siamensis can reach a length of over 30 cm. Lower, more dense stocks are formed by the proven, undemanding cryptocorynes from the Sri Lanka group (Cryptocoryne wendtii, C. beckettii, C. undulata and C. walkeri), which are also extraordinarily diverse. 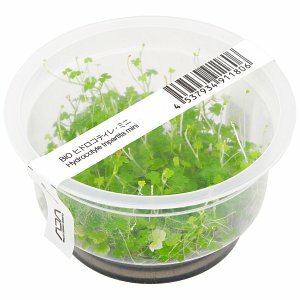 Their spread through sub-substrate runners can be limited by planting them in small containers, such as plastic cups buried in the substrate. Very attractive are also the cryptocorynes with very narrow, band-like leaves like the rare, light green Cryptocoryne spiralis var. caudigera ("Shola") from India and the brown-grained Cryptocoryne albida "Brown" from Southeast Asia. Most sword plant species and varieties (Echinodorus) work best as solitary plants. A free-standing, extensive echinodorus leaf rosette sets a strong accent in the aquarium. There are various rather small sword plants like the deep dark red Echinodorus 'Reni' and the light to medium green real Echinodorus schlueteri (in trade mostly as Echinodorus cordifolius 'Mini)', but also very high growing forms like Echinodorus grisebachii 'Bleherae' can be placed in the middle ground, provided there is enough space. Of all stolon sword plants, Helanthium bolivianum 'Vesuvius' with its very narrow, tightly spiralled and twisted leaves is particularly decorative. Water sprites (Ceratopteris thalictroides and Ceratopteris cornuta) are magnificent solitary plants, as well. Differently to what one would expect from ferns, they are extremely fast-growing. They grow into large bushes with light green, feathered leaves and are easily propagated by adventitious plants on older leaves. Although it is a stem plant in structure, the Japanese threadwort, Blyxa japonica, has much in common with rosette plants in appearance. 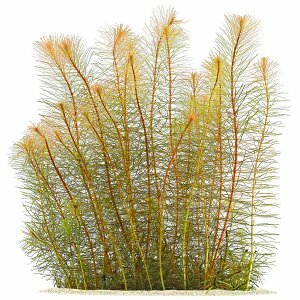 This genuine underwater plant forms magnificent grass-like stands in the middle ground in light green to reddish tones and is one of the most popular plants in aquascaping. The Eriocaulon sp. 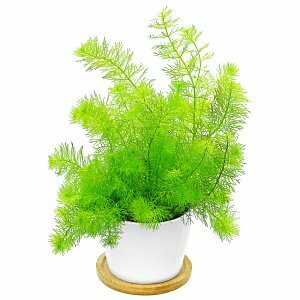 "Feather Duster" forms very fine-leafed, higher "grass bushes". Eriocaulons are generally considered to be quite demanding, but this is by no means the case with this remarkable plant. Also Eriocaulon sp. 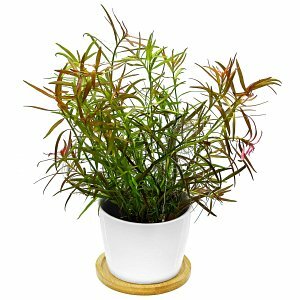 "Vietnam" turned out to be extremely undemanding; this plant is probably suitable for almost every freshwater aquarium and deserves much more popularity in aquaristics. The hardscape, i.e. decorative materials such as stones and roots, is usually placed in the aquarium's middle ground, but often forms an organic unit with the background. Epiphytic plants such as Anubias, Bucephalandra, Schismatoglottis roseospatha, ferns and mosses find their ideal habitats on the Hardscape and are particularly nice to look at there. They therefore also belong to the aquarium plants suitable for the middle ground.